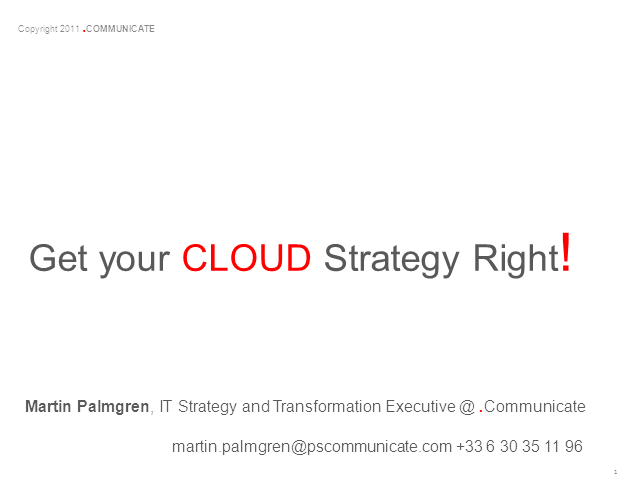 Get Your Cloud Strategy Right! As you move to the cloud, ensure that you secure your IT Delivery capabilities with spelled out business objectives to which the IT organization can deliver with an effective service strategy to leverage IT in the execution of the business strategy. Where security is important, and I would think twice on the data that I would choose to put on the cloud, time to market and cost effectiveness are the critical success factors. Time to market should not only include “how fast do we get IT services set” but how can we leverage the business strategy execution with IT as we support the end to end delivery of new products / services to market. Title: Get Your Cloud Strategy Right!